The Phillies offense continued to impress on Friday, easily handling the Twins in the opener of a three-game set at Citizens Bank Park, 10-4. Minnesota starter Jake Odorizzi was chased in the opening frame, having recorded just two outs. The Phillies put up a five spot to open the contest and cruised from there on out. "We've grinded down pitchers," said Phils manager Gabe Kapler. "We've gotten big hits. But it's the deep counts. It's the walks. It's the great at-bats that have carried us thus far. Even when we've had some guys who haven't gotten hits at the end of those at-bats. We talked about it last year, it's an even deeper lineup that does the same thing." 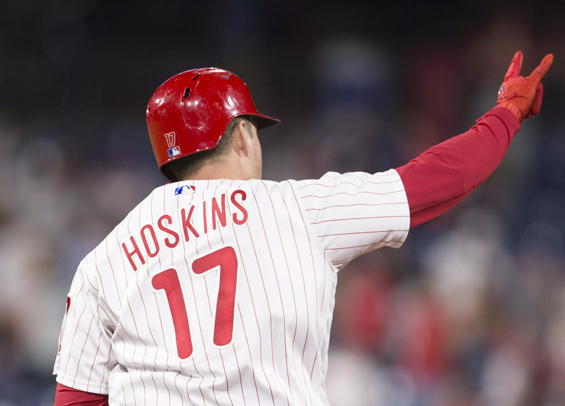 Rhys Hoskins led the offense for Philadelphia, finishing 3-for-4 with four RBIs. Maikel Franco drove in a pair and doubled in the winning effort. His OPS of 1.537 leads the Phillies. The first half of the contest was played in a steady rain. "It was really rough out there," Kapler said. "It was cold. And it was just a consistent wet. I know the outfielders were having some trouble seeing the ball." In addition to timely hits by Franco and Hoskins, the offense as a whole worked nine walks and forced Minnesota hurlers to toss 192 pitches, a mark significantly higher than the average in a ballgame. “The story tonight is 192 pitches,” Kapler added. “The league average is 140-ish. That's what we've done the entire season." Nick Pivetta surrendered four runs - three earned - on nine hits over five innings. He looked better than he did in his first performance last week, but he's still not yet where he wants to be. The two clubs resume their three-game set on Saturday with Jake Arrieta facing Michael Pineda.